I am now the proud owner of TCM Spotlight: Esther Williams, Volume 2. The Box Set. Thank you Mom and Dad. Prepare for silliness. Mimi (Esther Willimas) is a beautifully tanned, white resident of Tahiti. She longs to leave the island to find a higher calling than living in paradise. She already has a boat ticket away. 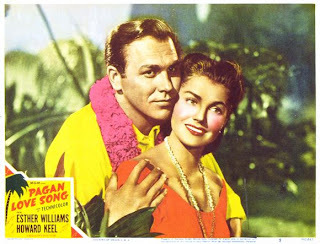 Hazard Endicott (Howard Keel) arrives on the island of Tahiti (Hawaii) to take hold of a plantation he has inherited. When he first sees Mimi she is in a canoe with her friends. He mistakes her for a native islander and tosses coins for her to catch, while speaking to her in really painfully slow and loud English. Mimi decides to mess with him, adopting an island accent and pretending to be what he thinks she is. Endicott hires Mimi's two friends (one of whom is a very young Rita Moreno) to be his housekeepers (although he really wanted to hire Mimi). He is surprised by how small and run down his plantation is, but his new workers tell him it will look great when it is cleaned up. Endicott sings a song about the "house of singing bamboo." Endicott comes to love his new house and the island. He sings a song involving lines like "How-dee-doo" and "You are well I trust?" Endicott sings a reprise of his "House of Singing Bamboo" song while holding a pig in his lap. Endicott finally discovers that Mimi is not really a native, when she invites him to a party at her house. He shows up in island attire, only to feel out of place when he is surrounded by white people in fancy suits and dresses. Endicott and Mimi fall in love, and Mimi's family become hopeful that she will stay on the island to be with him. Endicott ends up with three island children staying with him, and he sings with them about etiquette. "Etiquette, etiquette, always fold your serviette..."
And so on, with some twists and turns, one involving the native workers leaving Endicott's coconut crop outside where it can rot in the rain and him getting very very angry. It was not as much fun to watch once Jeremy left. He didn't even get to see the synchronized swimming. Not the real swimming and not the fantasy swimming. I feel like I've been typing this a lot lately, but one star. It would be hard to have a good movie with silly, happy islanders, some of whom are probably white people with their faces painted. Oh my. I may someday watch it again, though, because as with my least favorite Cary Grant movies, I do own it.